The Moist Collection for Natural Hair includes: Sulfate Free Shampoo, Triple Moisture Rich Conditioner, Honey Miracle Hair Mask and the Butter Cream Daily Moisturizer. The Collection does not include the Twist and Define Cream. Like the other commenters have said, I too was truly amazed at the results of my hair after using the moist collection line. I bought the sample pack just to see how I'd like it. Love it! My hair has never felt so soft and have so much shine. My curls are usually tight, like a kindky afro but with these products my curl bounce when I move! I ABSOLUTELY LOVE TGIN! I USED THE PRODUCTS FOR THE FIRST TIME THIS MONTH AND MY HAIR STAYED SO SOFT AND MOISTURIZED FOR A WHOLE WEEK WHILE IT WAS TWISTED AND ANOTHER WHOLE WEEK WHILE IT WAS OUT AND THAT NEVER HAPPENS! I WAS AMAZED AND SO WERE ALL OF MY AUNTS! I FOUND A PRODUCT I CAN'T LIVE WITHOUT AND IT FEELS SO GOOD! IF YOU EVER NEED BRAND AMBASSADORS, I WILL GLADLY DO IT. I LOVE CHRIS-TIA DONALDSON AND I DON'T KNOW HOW SHE FIGURED OUT THIS MAGIC, BUT SHE SAVED MY HAIR FROM THE STRUGGLE AND SAVED MY LIFE. I WANT TO MEET HER AND THANK HER IN PERSON FOR THIS BLACK GIRL MAGIC POTION. THANK YOU TGIN! THANK GOD I'M NATURAL AND CAN USE THIS LINE! Okay so I'd been eyeing this product for the entire time of my natural hair journey so almost a year and I finally got the entire line, I started off with the amazing shampoo, followed up with the conditioner, then deep conditioner. 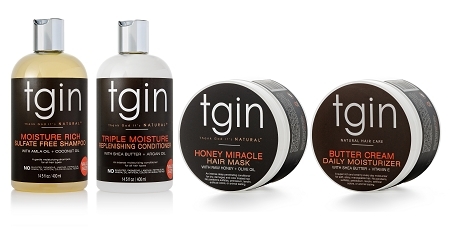 After that, I used tgin's leave in conditioner, followed by their daily moisturizer and sealed it all in with their lightweight oil. I wanted to see how the ENTIRE product line worked. I have 3abc curls, low-porosity, fine, thin, 12-14 in hair. The shampoo is nothing short of even sent. It's amazing, it did everything I dreamed a shampoo would do, thoroughly clean my hair, while keeping moisture, lots of foam and a little going a long way. Usually I need to use a shampoo twice to really get rid of the build up, but not this time! Once was enough, the conditioner, was great, lots of slip, detangling was a breeze, and at this point, my hair was already softer than normal, more manageable and the frizz I'd usually see at that point was nonexistent. After rinsing the conditioner out, I put on the deep conditioner, and before even adding heat to my hair my curls began to pop, still saw zero frizz and the consistency to me is very creamy which my low-porosity hair ABSOLUTELY LOVES, so it melted right in. I put on a heating cap for about an hour and a half and my curls were again popped, the frizz I most definitively see was not there. My hair smelled great, looked great and just felt rejuvenated. The leave in conditioner smelled great, my curls popped but not as much as I'm used too and the daily moisturizer moisturized my hair but I didn't receive as much moisture as I usually do with my camille rose naturals curlaide butter. But the consistency for them both was light, my hair wasn't weighed down at all and the moisturizer as a real creamy consistency that my hair loved. So I already purchased the replenishing conditioner, shampoo and deep conditioner. (I bought the sample sizes first) My thing now is to see whether I'll be buying the leave in conditioner because I will not be buying the moisturizer just because I have an expensive, better moisturizing product. But the frizz was nonexistent, my hair felt more manageable, a little of the product goes a long way so I'm no longer shying away from the price, the moisture is amazing. Overall a great line. Ok, this collection is so good that I don't even know where to start. First off, let me say that I am a big fan of fragrance and each product smells yummy! My hair is normally very dry, even after I use the products that I was using before this line. Well, I recently used this collection of products and I was in shock. Everything did exactly what it was supposed to do! The sulfate free shampoo was gentle and left my hair feeling clean. The replenishing conditioner had lots of slip. The hair mask is super moisturizing and after it's washed out my hair felt so soft! Last but not least the daily moisturizer actually kept my hair moisturized for more than just a few hours. Very moisturizing! If this collection came in travel size, it would be my dream come true.